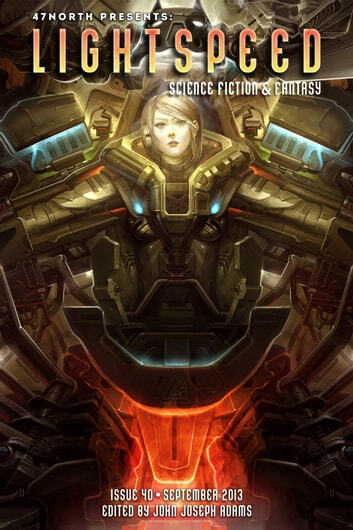 This month, we have original science fiction by D. Thomas Minton (“The Schrödinger War”) and Will McIntosh (“Dry Bite”), along with SF reprints by Lisa Tuttle (“Ragged Claws”) and Nina Allan (“Angelus”). Plus, we have original fantasy by Seanan McGuire (“Homecoming”) and a new Gorlen story by Marc Laidlaw (“Bellweather”) and fantasy reprints by Gene Wolfe (“Suzanne Delage”) and the first Erm Kaslo tale by Matthew Hughes (“And Then Some”). All that, and of course we also have our usual assortment of author and artist spotlights, along with feature interviews with io9’s Annalee Newitz and author of The Shining Girls, Lauren Beukes. For our ebook readers, we also have the novella “The Secret Sharer” by Robert Silverberg and excerpts of Shaman by Kim Stanley Robinson and The Palace Job by Patrick Weekes.